Detroit hip-hop legends Slum Village stopped in Lawrence last night as a part of the King's Court Tour. The remaining members of the group (T3 and Young RJ -- R.I.P. J Dilla and Baatin) performed songs old and new for the small group of loyal hip-hop heads that came out Thursday night. 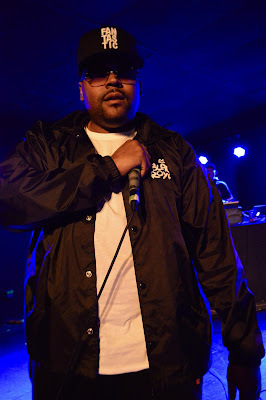 Slum Village brought along other rappers from Detroit, past and present, including Black Milk, Guilty Simpson, Phat Kat, Rosewood 2055, and Supa K. Local openers were Lincoln Marshall (Approach & Milkdrop).